Generally regarded as one of the best point guards in the NBA, Chris Paul is a perennial All-Star who is still chasing his first title. While that will ultimately dictate his overall legacy, Chris Paul rookie cards are popular and continue to see good interest from collectors. Although he has been with several franchises during his career, CP3 was a star in New Orleans and helped turn the Clippers into one of the top teams in the NBA. Now with Houston alongside James Harden, if the Rockets can make a deep playoff run (or several), Chris Paul rookie cards will enjoy a nice boost. Shop for Chris Paul rookie cards on eBay. 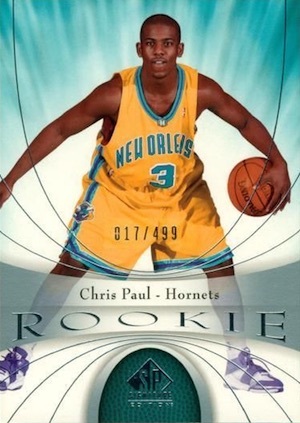 The following guide features 10 of the top Chris Paul rookie cards. While it is not included in the list below, his 2005-06 Upper Deck Portraits rookie card, numbered to just 99 copies, is still worth noting. Despite being tied with two of the other Chris Paul rookie cards as the rarest, there is little else to make the card special and it rarely surfaces. 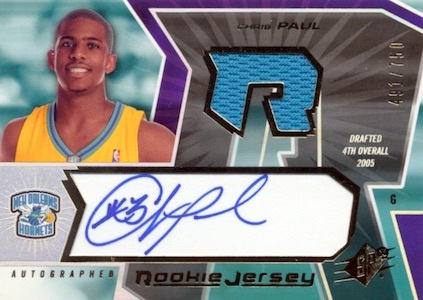 For a complete RC rundown, view the full Chris Paul rookie card checklist. Offering both a great budget rookie and the opportunity for some high value with the many Refractors, the 2005-06 Topps Chrome is the most popular RC for Paul that is not numbered. Parallels include base Refractors (#/999), Black Refractors (#/399), Gold Refractors (#/99) and X-Fractors (#/90). 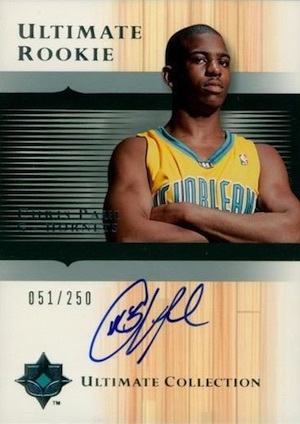 Although Chris Paul's intense stare and open mouth immediately catches the eye, the 2005-06 SP Game Used rookie card brings a lot of elements, and they largely work. Numbered to 999, there are also several parallels that add a different foil color and lower print run. A popular brand with hockey collectors, Upper Deck Trilogy covered a few NBA seasons in the 2000s, as well. 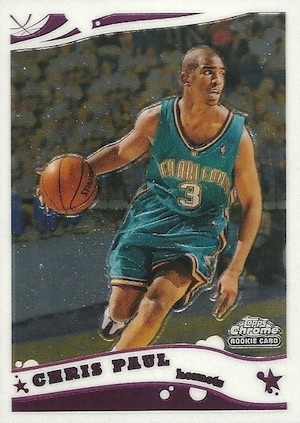 As one of the most unique Chris Paul rookie cards, it makes for an intriguing option even without a signature. The acetate rookie has a print run of 599 copies. 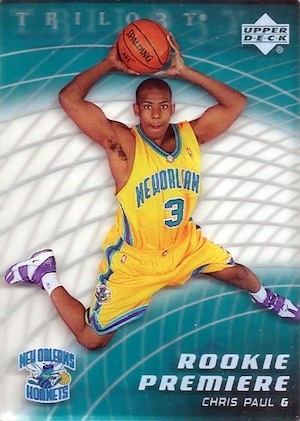 Certainly not the best design from the brand, the 2005-06 Finest Chris Paul rookie card utilizes a large blue basketball that dominates the background. However, the limited print run and Refractor parallels make this one of the preferred base rookie cards. Various parallels include Refractors (#/249), Red Refractors (#/169), Green Refractors (#/89), Gold Refractors (#/39) and Black Refractors (#/19). Worth noting in case blue is not your style, the Refractor options actually change the main basketball color. This 2005-06 SP Signature Edition card is not signed, but it still presents a strong Chris Paul rookie card option. With a print run of 499, the card remains in decent supply and it features one of the better designs. 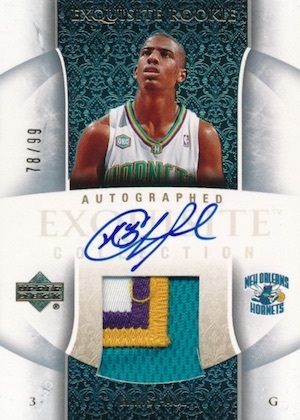 The first of several Chris Paul rookie autographs, SPx normally features some of the most wild rookie card designs and that is taken to another level given the colors of the Hornets. Although the trapped autograph is not ideal and the tiny jersey piece is easy to miss, this signed card is among the best Chris Paul rookies. 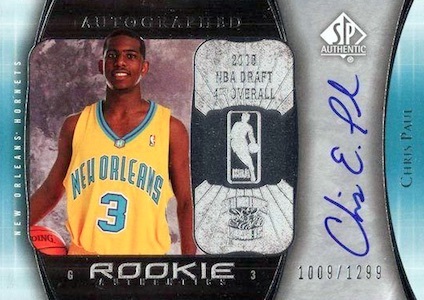 Even with the higher print run, the 2005-06 SP Authentic Chris Paul rookie card bests SPx because of the on-card signature. 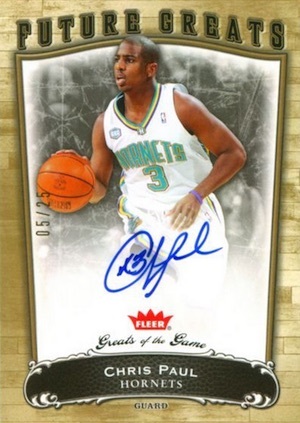 Further adding to the appeal, the card is also the only Chris Paul rookie card to feature a full signature versus the normal mashup his cards traditionally have. Patch parallels add a small jersey swatch in place of the NBA foil logo. Not nearly as well known as the other brands at the top, Fleer Greats of the Games earns a high spot based on the very low print run and on-card autograph. 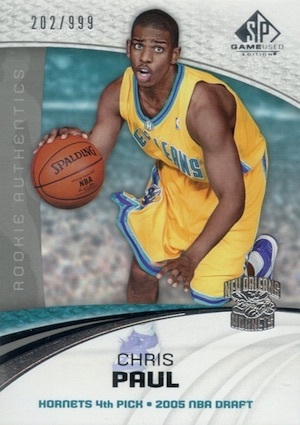 The base 2005-06 Chris Paul rookie card has a silver color scheme and is numbered to 99. The gold version is shown below and is limited to just 25 copies. 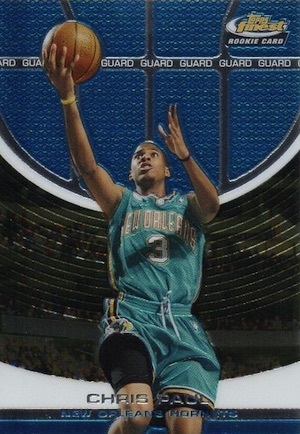 A very popular option with collectors, 2005-06 Ultimate Collection features a standout Chris Paul rookie card. The hardwood background is a nice signing surface but the lined middle section does make the text harder to read. The undisputed champion among Chris Paul cards, 2005-06 Exquisite Collection combines an on-card signature, medium-sized patch and low print run to make the preferred Chris Paul rookie card. Even ungraded, these rare cards sell for four figures. Chris Paul 05-06 Bowman Chrome Rookie Card RC #111...#7 all-time assists!!! SP Signature shouldn’t confuse anyone. It was called that because you were guaranteed one autograph per pack, which was actually a tin. Billy Kingsley � I am quite familiar with the product. I have heard from new collectors wondering why they had a card with “Signature” in the title and yet the card was not signed. They asked if it was a mistake and if the card was worth more because of it. I don’t think “SP Signature Edition” would mislead a basketball card collector. It was a well known product. 2005 UD Portrait Chris Paul Auto Black and White Parallel 8x10 RC Rockets!! !